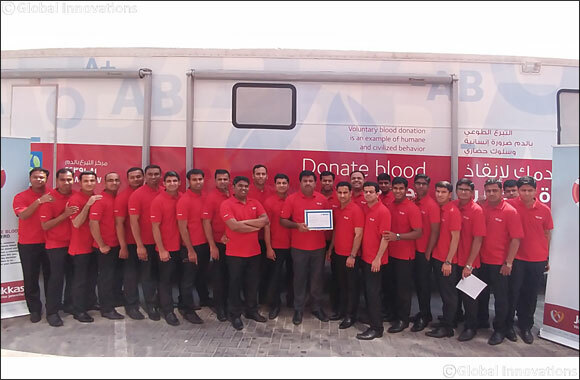 Joyalukkas conducts Blood Donation initiative in association with Hamad Hospital. Doha, Qatar, July 31, 2016: Joyalukkas is continuing its push to build awareness on the importance of blood donation under its inspiring slogan ‘Donate Blood, be a hero’ with the Blood Donation camp held in association with the Hamad Hospital blood donar unit at Joyalukkas showroom, Al Watan Center. Under this initiative Joyalukkas employees donated blood on a voluntary basis. The donated blood will be valuable to save many lives in Qatar. Joyalukkas CSR team organizes their Blood Donation drive not only in Qatar but throughout GCC, India, Malaysia and Singapore. “We strongly encourage the ‘spirit of giving’ and donating blood, means you help save lives and our employees understand this and come forward at every occasion possible. We have received a phenomenal response from the Blood Donation Drive from our own staff and I am glad we are showing the way for others to follow. I would like to take this opportunity to request all healthy individuals to frequently ‘Donate blood and be a hero” also I must add donating blood is also a healthy practice”, said Mr. John Paul Alukkas, Executive Director, Joyalukkas Group. Giving Blood is the easiest way to directly save a life and the most valuable donation a person can make. Thousands of people who are terminally ill or victims of tragic accidents, depend on blood supplies being available. It takes very little time and the nature’s brilliance ensures that the human body replaces the donated blood in their system within 24 hours. In fact it’s extremely healthy to encourage your body to regenerate new blood on a regular basis.